Have You Forgotten That Stock Markets Go Up? Have you noticed that nearly every investor is investing defensively these days? Many investors have lost faith in the long term growth of the stock market. This is not surprising after the big crash in 2008. It has made investors more aware of risk. It can be hard for investors to know what to do when they are not confident in the market. The bottom in the market was 20 months ago, but there is still a lot of bad news and fear about what may happen. Will we have another debt crisis? Will we have high inflation? Will unemployment stay high? Will the market crash again? What happened in the past when we had pessimistic times like this? Stock market growth is much more consistent over time than most investors realize. Pessimistic times are usually the best times to invest. Maintaining long term faith in the stock market is very rewarding. Why are gains so consistent? The stock market is primarily driven by the profits of huge companies. Whatever happens in the economy or politics, companies are able to adjust their operations so that they can continue to increase their profits. They can cut costs, raise prices, develop new products or expand to new regions. In addition, new companies with high profits are often created and join the stock market. For example, quite a few large, very profitable companies in technology such as Microsoft, Google, Research in Motion, Apple, eBay, Dell and Cisco were tiny or did not exist 20 years ago. The stock market has been described as a see-saw moving up a hill. Over time, these huge companies are able to grow their profits. Short term, sentiment is erratic because much of it is based on human emotion. However, eventually logic and the fundamentals of rising profits will win and the market will rise. That is why the market consistently rises when you stay invested long enough. Pessimistic times are generally the best times to invest. In pessimistic times like this, the question is always asked: Is it different this time? Could the system collapse “this time” or could we have another decade of low growth “this time”? Note first of all that there are hardly any decades without a gain. There is a more interesting and surprising conclusion, though. Note the low periods in the graph? Now look 10-15 years before and after each low period. Note that there are big, high peaks in the 10-year periods just before and just after the lows? 1999-2008 -1.5% 1989-98 19.3% 2009-18 ? There are always many reasons given for decades of high or low growth, but perhaps there is a much more simple reason – market returns are much more consistent than investors realize. Bad decades are usually preceded and followed by great decades (and vice versa), which just brings the non-normal returns back closer to normal. In short, investors have been well-rewarded by maintaining faith in the stock market – especially during pessimistic times. From our experience, we have noticed that investors that have faith in the stock markets long term tend to do very well, while those that are nervous of the market tend to buy and sell at all the wrong times. The most successful investors tend to be the ones that stay invested all the time. Doubling your money over 20 years is not great, but if that is the worst-case scenario, but it is certainly nothing to be scared of! Whenever the stock market returns are low, comparisons are made to other investments. Since the last 10 years have had no gain, investing in almost anything else would have been better. What are investors doing now? Investors have a short term memory and tend to base their investment strategy on recent events. That is why the most popular investments now are cash, bonds, GICs, gold and real estate (in Canada), with stock market investments focusing on dividend stocks, market-timing strategies, or “anything with a yield”. These are all the areas that performed better in the last 10 years and they are all defensive in nature. They are popular because of the fear created by 2008 and negative news. However, how do these other investments compare long term? 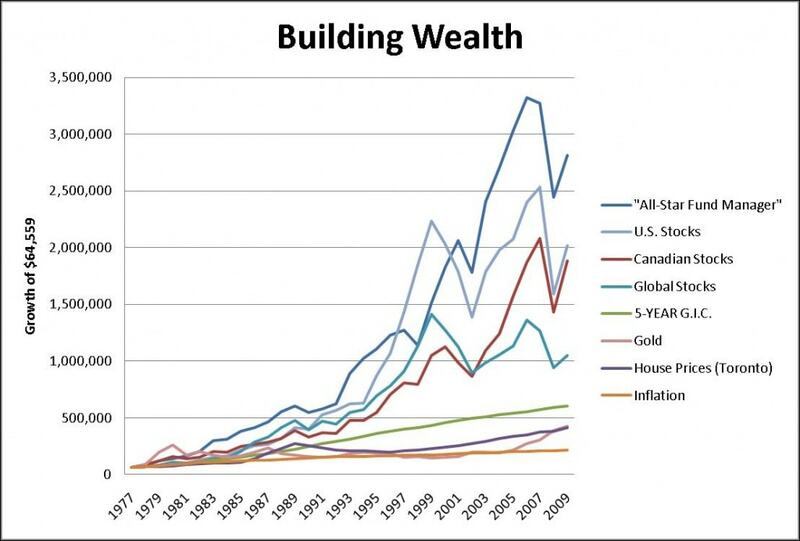 The surprising truth is in the chart below – the long term growth of other investments, such as G.I.C.’s, real estate or gold, is tiny compared to the stock market. Note that gold and real estate have not even kept up with G.I.C.’s! The dollar values in this chart start with $64,559, which was the average price of a home in Toronto in 1977. At the end of 2009, the average home in Toronto was worth $411.931, but if you had invested the same amount in the Toronto Stock Exchange, you would have had $1,886,820. You could now buy almost 5 houses! Investing and staying invested in the stock market is very rewarding. It can be hard for investors to know what to do when they are not confident in the market. Market history shows why investors should maintain confidence in the stock market as the main investment vehicle for retirement planning and other long term goals. The stock market consistently rises when you stay invested long enough. This is particularly true during periods of time like today when there are many reasons to be pessimistic. Investing during “maximum pessimism” and after bad decades have been the best times to invest. Investors that have faith in the stock markets long term tend to be very well rewarded, while those that are nervous of the market tend to buy and sell at all the wrong times. The most successful investors tend to be the ones that stay invested all the time. I agree with the principle of staying invested for the long term, and also trying to do your best to time the majority of your purchases when stock prices are low while holding cash reserves during boom times. I’m not sure it’s fair to categorize dividend stocks in with the other asset classes you suggest the pessimists flock to after a crash, and then not include dividend stocks in your chart of returns. Dividends make up a good portion of the overall market returns, and dividend growth stocks are proven to not only be a safe investment, but they have plenty of growth opportunities as well. If all investors knew that, investors with faith would not be as rewarded! ;-) But, yes there should be more faith in stock market overall. Great post Ed. A long term perspective like yours is very refreshing. The markets are very resilient when you consider all of the bear markets and economic turmoil we’ve been through. Still I shudder to think what we would have to go through to actually see a collapse in the “system”. If Helicopter Ben wants asset (stocks) inflation, he’ll get his asset inflation. He’ll also get a lot of nasty side effects, but at least he’ll get his stock market inflation. If you’re in stocks, you’ve been having a great ride. If you’re in bonds, you might want to bail, you’re at the top of a huge bond bubble that is primed to explode all over the place. The masses have moved to bonds, driven down yields (to the point of negative real returns) and once inflation begins, bonds will lose a significant portion of their value (and have even worse negative real returns). I agree with investing for the long term, but I wonder if the data presented is not as clear as it could be. Total return of stocks (including dividends) is a big factor on the plus side for stocks, it is not clear if dividends are factored into the data. It seems that these are nominal returns, not inflation adjusted. The 14.8% return from ’75-’84 isn’t so impressive in a time of double digit inflation. Wow! Nice timing for the article! Your rolling 10-year chart of the S&P 500 is quite striking. Who knows what predictive value it has but it certainly seems to point to a rosy near future for stocks. I think your case is likely to be quite persuasive for people nervous about stock investing. I’d prefer to see real returns as Greg says, but the average person probably understands nominal returns better. My way of dealing with my scaredy catness was to just keep investing at my normal rate every packcheck but I made more effort to put extra windfalls into safer investments (like paying down the mortgage). 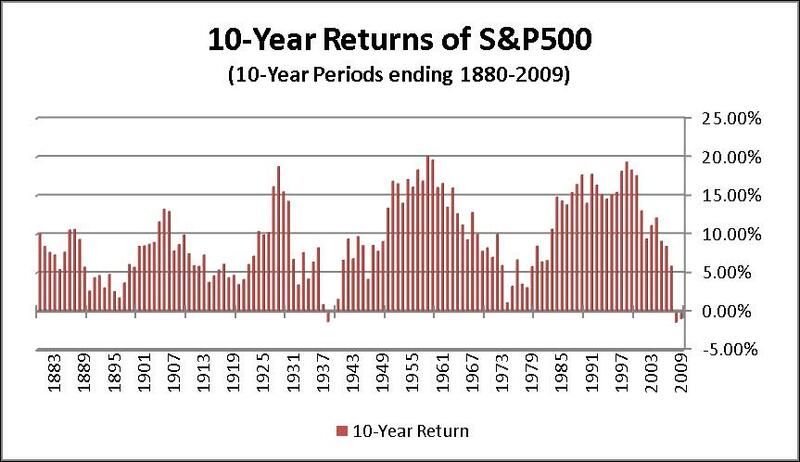 The 10-year return chart shows stock market returns that include dividends. I have not subtracted inflation exactly for the reason you mentioned, Michael – it is easier for readers to understand. The returns shown are the actual investment gains investors would have made at the index return. News coverage in the last 2 years has included one fear after another – an “Apocalypse du jour”. What if the system collapses? What if we have depression? What if we have hyper-inflation? What if countries can’t pay their debts. However, all these fears happened in the last 140 years and the stock markets still gained relatively steadily. The stock market risk is much lower than most people think and has been generally kind to long term, patient investors. The following quote from Warren Buffett does a pretty good job of summing up how strongly I agree with this well written article. It’s easy to say “those are the gains, go get them”, but there is more learning required to achieve or beat the gains of the benchmark. Problem is, we are clouded from seeing those gains because of restrictive pensons, MER fees, tracking errors, currency spreads, hedging or poor performing fund managers. Very well done. I’m a big fan of the long term view as well and plan on holding my current portfolio (100% stocks, 0% bonds) for 20-25 years and only liquidate it gradually at retirement. Solid companies with good business models should be able to ride out the economic bumps. I am also of the view that a massive systemic collapse that would send all these companies bankrupt and ruin me would also destroy the CPP, my pension, etc., and render the Canadian currency worthless. All investments would be decimated, no matter what they are. So I believe that this all-stock approach is reasonable and not imprudent. BTW, thanks NatBank for that 6% dividend increase. Much appreciated. Now I remember why I don’t own bonds. I follow the idea of “buy and homework”. I got out before the last crash at 14,000. Bought back in near the bottom at 7,000. Portfolio is up over 15% this year. Great use of your Andex chart! Wait a second. You’re suggesting we should buy into the stock market when it’s low, times are uncertain, and most people are avoiding it? Nooooo thank you. I’ll wait until things turn around and pick up again. Markets don’t always go up over the long term. How long will you wait? Until the market is up 30%? 50%? How much of the recovery are you willing to miss? Most people feel like you that they want to see the market moving up strongly and be sure it is a solid recovery before investing. That usually means a minimum of 30-50% rise that they miss, and very often much more than that. My point is that maintaining faith in the market leads to successful investing. When times are uncertain and people are panicking, that is what market opportunity looks like. If you wait until investing everything is moving up strongly and everyone else is invested, so that you feel comfortable in the crowd, then you are usually buying in high. Probably the best time to invest during our lifetime was March, 2009 at the height of the panic. Investors who understand the market and are confident in it then have been well rewarded. The Japan chart starts to late, so it misses the real story. Japan’s market had one of the biggest bubbles ever rocketing from under 2,000 in 1970 to nearly 40,000 in 1989. That was a far bigger bubble than the tech bubble. When you include the rise and the fall, the total return of the Nikkei from 1970-2000 was nearly 8%/year. Markets sometimes get far ahead of themselves. For example, the NASDAQ was far ahead of itself by the end of the 1990s. So, this last decade has brought the returns down to earth. The NASDAQ lost 8%/year this last decade, but is still up 13%/year since 1990. In fact, we are not aware of any case of a major stock market that did not have reasonable returns once you get to 20-30 year periods. There have occasionally been extreme rises or falls in various stock markets, but when you include the recovery, you end up with reasonable growth. Probably the most extreme examples were Germany and Japan when they lost the war and the Great Depression. In all 3 cases, the markets bounced back to provide decent returns after 20 years. This has not been the case with bonds, where there are quite a few examples of permanent losses or many decades with no growth. For example, German bonds went to zero in the 1922-23 hyper-inflation. After Germany lost the war in 1945, their bonds lost nearly all their value again and took until about 1990 to get back even. An interesting story is that the bond crash was a major contributor to the Great Depression. Many countries had hyper inflation after WWI in the early 1920s. Bonds lost 100% of their value in a few countries and had huge losses in many countries. Investors realized that bonds provided no protection in inflation, but stocks did, so there was a massive move to stocks. This led to the “roaring 20s”, which ended in a bubble that popped in 1929. The stock market bubble in the 1920s was probably the main reason for the huge crash in the early 1930s. The market did not recover until 1942. Just like the other example, if you take any 20-year period that includes the Great Depression, stocks did fine. We are not aware of any example of a major stock market any time in history anywhere in the world that did not have reasonable growth once you are invested for 20-30 years. Thanks for posting this. So many people forget to “buy low, sell high” and get scared when the price is TOO low. I just wish I had a little extra to invest! Ed – interesting points on the 1920s hyperinflations driving a stock bubble. The 1920s was also a period like the 1990s with new-age inventions that were meant to change the world. As for the Japan example…I believe if you run your investing horizon from 1985 to present you’d have a 0% annualized return over 25 years. While I agree that for capitalism to work, investors must receive a positive return on invested capital, I wouldn’t want anyone to think this is a truism that is written in stone for every market. I think this makes a great case for diversification. I think the basic truth and message of what Ed is saying is true even today when stock markets are near their peaks, but in light of the exuberance in the market, the article looks very dated. It would be beneficial to see what happens to your investment over time if you invest at market peaks.